While they simmer on the stove, you can smell the hearty goodness of Bear Creek®soups. They're quick and easy to make and come in 15 delicious varieties. These soups have a homemade taste that will satisfy every appetite. A favorite original Bear Creek® soup. A thick and creamy soup like mom used to make. 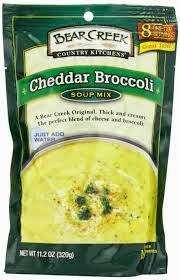 With a rich blend of cheeses, broccoli and seasonings. Yields about 8 one-cup servings. Also comes in a convenient 4 one-cup serving size. Try adding chicken, sour cream and shredded cheddar cheese for variety. This soup was delicious! I'm a huge fan of broccoli soup so this was one of my favorites. It was so rich and creamy just like homemade. It definitely didn't taste like it was out of a package. Being pregnant and still suffering from morning sickness/all day sickness these soups came in handy. The seasoning in this soup was right on, not too overwhelming and not to subtle. I also added in some chicken for added protein and it made for a great meal. This rich Bear Creek® soup tastes like you made it from scratch. A great cheese flavor, hearty potatoes, all seasoned perfectly with parsley, herbsand spices. Try adding crumbled bacon, sour cream and shredded cheddar cheese for variety. Potato soup is another one of my favorites so I absolutely loved this soup as well! It didn't taste like it was out of a package at all and I loved how easy it was to make. The seasoning was just perfect and I actually liked this soup better than many homemade versions I've had over the years. I added in some crumbled bacon and cheddar cheese on top and it was so good!